Holbrook Lumber – Since 1911 - anticipating the needs of tomorrow’s market – today! Holbrook Lumber began in Springfield Mass. in 1911, as the business of Frederick A. Holbrook. After a ten year career working for the Fred Morse Lumber company, a wholesale distributor of lumber materials, Mr. Holbrook decided to start his own business at the young age of 32. Fred Holbrook was a very driven and successful business man who along with running a large wholesale operation was very involved in the local community. He devoted much of his time to local organizations such as the Shriners Hospital, the Rotary Club and most notably, served on the board of directors for the Springfield Safe and Trust Company with many other successful local business people. Fred Holbrook was a pioneer in the lumber industry and was influential in bringing many Western products to the East Coast. Holbrook Lumber was the premier dealer for PALCO who was the largest supplier of Redwood in the U.S at the time. Fred was also responsible for the influx of Idaho White Pine into the East, a product that is still very common in our region and preferred by many in the industry. With Fred at the helm, Holbrook Lumber flourished and when he passed away at the age of 78 he left behind not only a business legacy but a personal kindness as well. Mr. Holbrook bequeathed most of his estate to the local charities, hospitals and churches he served as a board member for, relatives and even to his employees whose dedication held a special place in his heart. One such act of kindness was the sale of the company to a small group of his sales force which included Paul Krihak the father of current owner and C.E.O Peter Krihak. In 1960 Paul Krihak made the decision to move Holbrook Lumber closer to his family and home and relocated the business to Albany, N.Y. just around the corner from our Fuller Rd. facilities. Paul was a lumber entrepreneur as well and continued in the same vein as Fred in developing new products and markets in the industry. 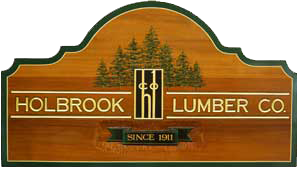 In 1965 Paul and Holbrook Lumber opened the first Pressure Treating facility in the North East. That facility is still operational today and has been treating with the Osmose system (now Koppers) for over 50 years! In 1976 Holbrook Lumber purchased the old US Plywood facility at 70 Fuller Rd. and remained there until we outgrew the space in 2013. During the mid 1970's Paul's son Peter began working in the yard at Holbrook Lumber and began what would be his journey in the lumber industry and ultimately a handing over of the torch. Peter went off to college for Forestry studies and graduated with a degree in business. He began to put his studies to work and was employed at a retail lumber yard and a saw mill in Idaho. Peter Krihak never looked back and the industry blood ran through his veins in much the same way as his predecessors. Peter returned to work for his father in 1987 as a sales rep and brought with him his industry knowledge and a passion for the business. In 1994 Peter became president of Holbrook Lumber Company and alongside his father ran the business until Paul retired in 2008 at the age of 82. Continuing in the same way as the two great men before him Peter has pioneered some very successful programs. With the larger lumber mills in the US and Canada beginning to cater to the big box stores with their premium grade dimensional lumber Peter began to explore the European mills as a source for quality wood fiber in our region. Working with over a dozen mills at one point throughout Europe, Peter established a consistent supply of high quality European Spruce with Klausner becoming the largest supplier to the network. Throughout the North East BetterBrand/Klausner products became synonymous with quality and independents once again were able to supply their customers with the high end products they deserved. Holbrook Lumber has made its name supplying quality products and service to independent retailers throughout the North Eastern United States. Peter and Holbrook Lumber are also behind the product E-Prime which has earned an excellent reputation throughout the entire region as a top performing line of trim boards, pattern stock and beveled siding. In 2013 needing more warehouse and yard space Holbrook moved from its Fuller road location into the Northeast Industrial Park in Guilderland center. Our Pressure treated facility still operates on Fuller Rd. along with our old warehouse which is now occupied by Habitat for Humanity. The move to the Industrial Park enabled us to greatly expand our inventory and upgrade our administrative offices. The Park also receives all three major Rail Lines which is very beneficial in the building materials industry. As long as there is a need for quality products and services for the independent retail lumber yard Holbrook Lumber will be there to fulfill those needs. We have been at it now for well over 100 years and look forward to continuing to serve our loyal and new customers. As a company we strive to work with only quality mills and suppliers worldwide with all of the products we bring to the marketplace. We have worked diligently to create and maintain strong, lasting relationships with these suppliers so that we can better serve our customers. In an ever changing economy and with new technologies entering the picture almost daily, we are poised and ready to do what we have always done.